• 0, 90, 180, & 270 degree position adjustments. • Monitoring, programming, and diagnostics view. • 3 optical buttons; up, down and enter. • Immune to interference from ambient light sources. • Useable with or without gloves. • From the LOI through guided user menu. • OMSET and HART modem. • HHC, DCS or AMS via HART. • For installation in zone 0, 1, 2 and zone 20, 21, 22 and in Class 1, Division 1 and 2 applications. • Hardware assessed for use in SIL 2 applications. • Mounting on 1.5”–2” pipe bracket or on wall / bulkhead. 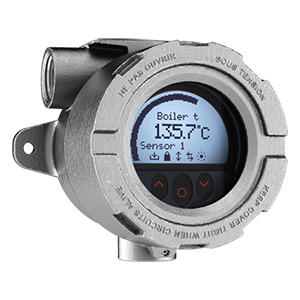 • Linearized temperature measurement with TC and RTD sensors e.g. Pt100 and Ni100. • HART communication and 4...20 mA analog PV output for individual, difference or average temperature measurement of up to two RTD or TC input sensors. • Conversion of linear resistance to a standard analog current signal, e.g from valves or Ohmic level sensors. • Amplification of bipolar mV signals to standard 4...20 mA current signals. • Up to 63 transmitters (HART 7) can be connected in a multidrop communication setup. • NAMUR NE43 and NE89. • HART protocol revision can be changed by user configuration to either HART 5 or HART 7 protocol. Link to Hart Programming Unit to get all Tech Reference & Drivers.